Fredric Shoberl : South Sea Islands, 1824. Shoberl, Fredric (Editor): The World in Miniature - South Sea Islands. Being a Description of the Manners, Customs, Characters, Religion, and State of Society amoung the Various Tribes scattered over the Great Ocean, called the Pacific or the South Sea. Illustrated with Twenty-Six Coloured Engravings. Printed for B. Ackermann, Repository of Arts, Strand, London, 1824. Frederic Shoberl (1775–1853), also known as Frederick Schoberl, was an English journalist, editor, translator and writer. 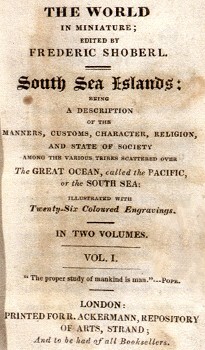 Two volumes of his extensive The World in Miniature series, Shoberl has edited from a number Pacific accounts that were avialable to him, probably starting with John Hawkesworth's Voyages in the Southern Hemisphere,1773, that contained edited selections from Byron, Carteret, Wallis and Cook's first voyage. Interestingly, he does not report surfriding in Hawaii, only paddling on boards "shaped like an anchor stock" (this is no doubt derived from Archibald Campbell), while Banks' surfriding account from Tahiti is related (in the voice of Cook) in Volume Two. 1812 Archibald Campbell : Surfboard Paddling, 1812. A singular kind of sport practised by these people consists of carrying a large stone under water ten feet deep from one point to another, at the distance of seventy yards. The difficulty is to persue a straight course; a person may thus run along the bottom twice as fast as another can swim. From their earliest years the islanders spend much of their spare time in the water, and constant practice renders them so dexterous that they seem quite as much as as ease in that element as on land. ... like an anchor stock, and paddling with their hands, but more commonly without any assistance whatsever. They appear to be a sort of amphibious animals, capable of living just as well in the water as on land. ... bring a number of things for barter, which they hold above the surface to keep from getting wet. Some of them, says Langdorff, would swim about the ship the greatest part of the day without appearing tired. Mafu, who has already been mentioned, though he had never been on board a European ship, would of his own accord run up the main-mast several times successfully and throw himself into the sea, to the great astonishmnet of the spectators. Such was the force of the fall and weight of his body, that several seconds elapsed before he again rose to the surface. Both men and women are remarkably cleanly, and constantly wash the whole body three times a day in running water. Accustomed to that element from their infancy, they are most expert swimmers. Whenever a surf broke over them, they dived under it and rose again on the other side. The stem of an old canoe added much to their sport. This they took out before them and swam with it as far as the outermost breach: when two or three getting into it and turning the square end to the breaking wave, were driven in towards the shore with incredible rapidity. sometimes almost to the beach; but generally the wave broke over them before they got half way: in which case they dived and rose to the other eide with the canoe in their hands, and swimming out with it again were again driven back. ... Captain for more than half all hour, during which time none of the swimmers attempted to return to the shore, but seemed to enjoy the diversion in the highest degree. We are assured that the women excel in this sport, and that if a shark should make its appearance among the playful swimmers, they all surround and force him on shore, if they can once get him into the surf, though they use no instruments for the purpose; and should he escape, they still continue their frolics without any apprehension of danger. ... cidentlly missed the boat and fell into the sea. The boy immediately leaped overboard, dived after and recovered it. As a reward for this feat some more beads were dropped to him; which excited a number of men and women to amuse the officers with their amazing feats of agility in the water; and they not only fetchted up several beads scattered at once, but likewise large nails which, from their weight, descended quickly to a considerable depth. Some of them continued a long time under water, and the velocity with which from its clearness they were seen to go down was very surprizing. The World in Miniature - South Sea Islands. Geoff Cater (2010) : Fredric Shoberl : South Sea Islands, 1824.